Nano Lavender from Oscha Slings is a prototype blend of 58% Tencel and 42% hemp. I calculate it to be in the region of 270 GSM, which nudges it into the ‘thicker’ category, however the wrap feels and wraps like a medium weight wrap. 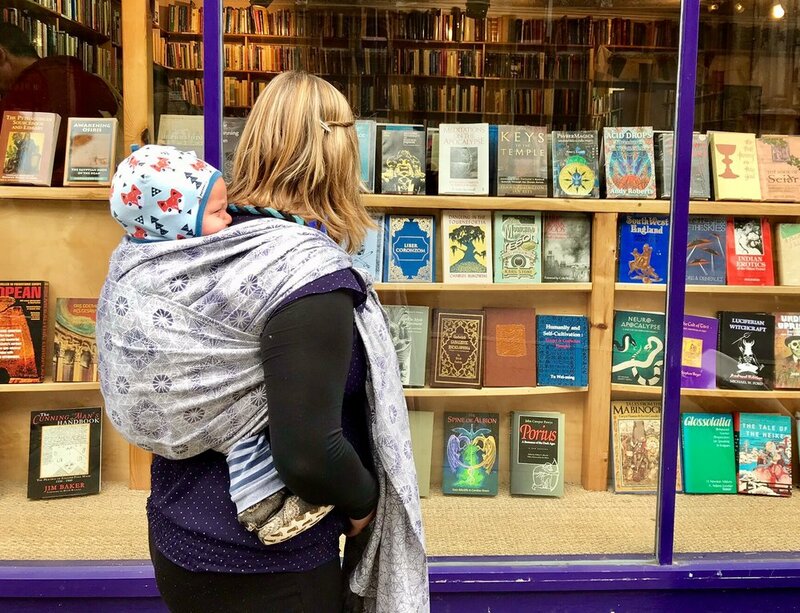 Oscha Slings was set up by a father and daughter team from a family - or "clan" - with a long history of babywearing. Based in Scotland, they were the first jacquard woven sling company in Great Britain. 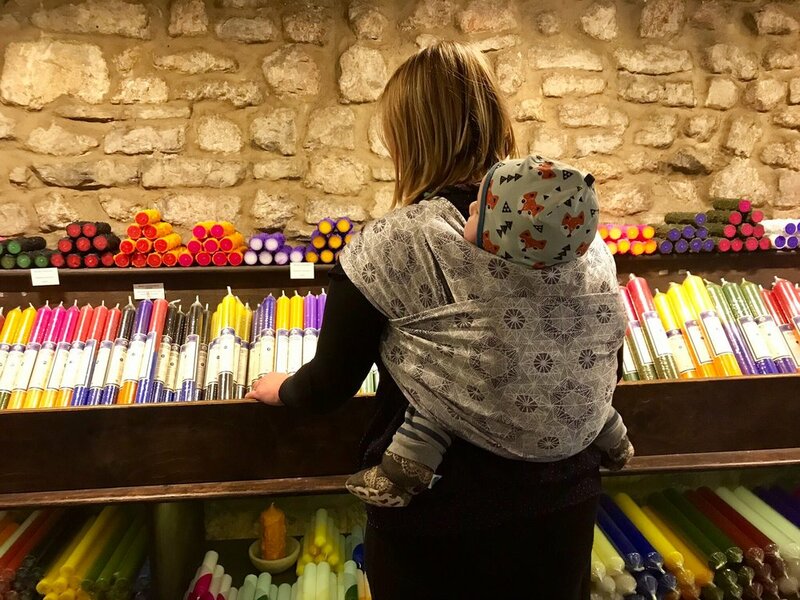 Oscha brought together their passions for art, design and babywearing to create wraps that became loved for their beauty, elegance and quality as much as their functionality. Their artistic focus played a significant part in the contemporary, artistically styled, fashion orientated wrap scene and led to Oscha being known fondly as 'The Wrap Artists'. 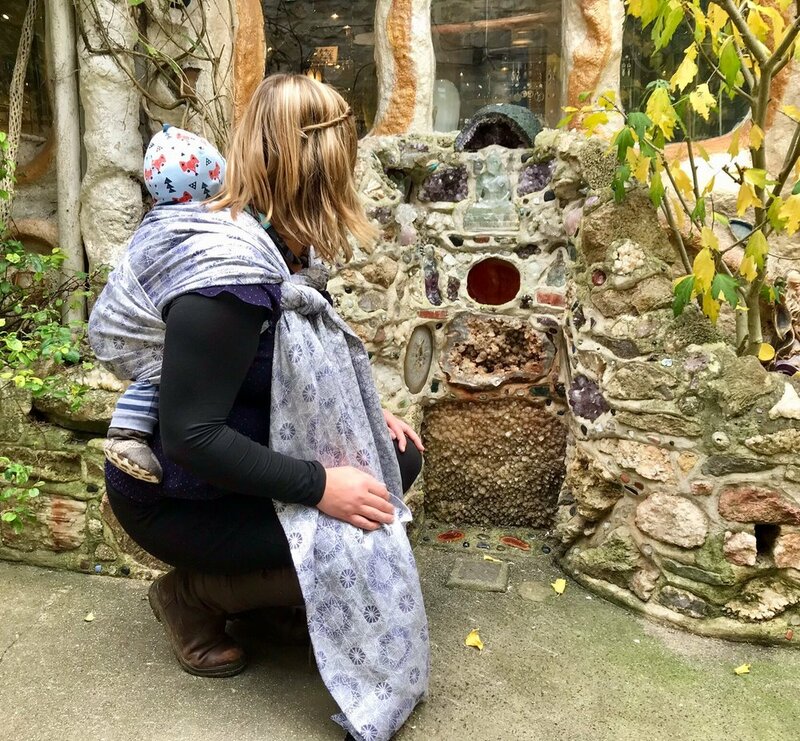 Their stunning and often intricate designs were the first to catch my eye as a new babywearer, and were responsible for sending me hurtling down the woven wrap rabbit hole! Nano is a relatively new design from Oscha. Inspired by kaleidoscopes, Nano is stunningly intricate and looks amazing both close up and from a distance. The geometric detail of the design reminds me of Andaluz, one of my all-time favourite Oscha designs both in terms of its looks and wrapping qualities. It’s safe to say that Nano may just have knocked Andaluz off the top spot of my Oscha designs ranking! This colourway teams a delicate shimmering silver warp with a navy weft, giving a beautiful lavender effect. With its silk-like sheen and subtle colourway, Nano Lavender would look perfectly at home at a wedding or other special event, but is also very wearable for every day adventures. Tencel is a brand name for Lyocell fibres and consists of cellulose fibre created from wood pulp. Although the ‘ingredients’ of Tencel are completely natural, the process of ‘regenerating’ the fibres, or creating the Tencel, means that it falls somewhere between the categories of ‘natural’ and ‘synthetic’ fibre. Tencel is considered to be an environmentally sustainable fabric as the wood pulp used in its creation comes from eucalyptus trees, which require less water and land than other natural fibres (like cotton), and very little pesticide, to grow. Almost all of the (non-toxic) chemicals used in the process of converting the wood pulp to Tencel fibres are recovered and reused, which means less wastage and a lower environmental impact. Tencel is often referred to as an alternative to cotton and I was keen to find out how its wrapping qualities compared. Nano Lavender is the first Tencel blend wrap I've tried and I admit to feeling a little bit nervous when I first felt it. In loom state it felt silky and luxurious but, frankly, as slippery as a well-oiled politician! Lenzing Fibres who manufacture Tencel celebrate the fact that Tencel fibres are much smoother than other fibres like cotton or wool, which makes it super kind to delicate baby (and mummy!) skin. The counter side of these benefits however is that the Tencel fibres themselves have less grip. Never fear though, my concerns abated after that first wash! Oscha have cleverly teamed the Tencel with lovely grippy, textured hemp and woven it into a textured, high-grip design. A quick wash and tumble dry made a huge difference and brought out that texture, banishing the ‘slippery’ feeling in hand. Nano Lavender feels soft and cool with a lovely floppy drape from that first wash. It wraps easily with the passes gliding into place, and makes a neat knot and slim CCCB. The weave is fairly tight, with only a small amount of diagonal stretch, which makes for a beautifully supportive and strong wrap. Nano Lavender feels thinner than its weight would suggest, with no bulk, yet it felt comfortable on my shoulders even over prolonged periods of wear with my rapidly growing 8-month old. Nano Lavender is strong and supportive enough to carry a toddler too, and would make a great, compact ‘handbag shorty’ for quick ups and downs. In base size with multi-layer carries, Nano Lavender will happily carry a toddler for extended periods. While the textured weave and hemp blend add grip to those smooth Tencel fibres, my wiggly, jumping, seat-popping little gremlin did manage to cause a little bit of slippage while trying to launch himself into the first solo baby flight! This slippage was minimal however, and a fair price to pay for the overall feel of the wrap. Despite the relatively tight weave, Nano Lavender feels breathable and cool to wear. Apparently Tencel has high moisture absorption properties, which contribute to the comfort of the wrapping experience and make Tencel a great choice for warmer, humid climates. Nano Lavender is extremely easy care. I found the Tencel blend to be far less prone to creasing than a cotton / hemp blend, or even a 100% cotton wrap might be. You can happily get away with not ironing it after a wash & tumble, and it seemed largely immune to creasing even during wear. Tencel provides an exciting, ethically sound and distinctly different alternative to cotton. Luxurious, cool and kind to delicate skin, with a stunning sheen, it lacks the grip of cotton but is comfortable to wear and extremely easy care. Teamed with naturally textured hemp, and woven into the beautiful, grippy Nano pattern, it creates a stunning wrap that’s soft and floppy enough for a newborn, yet strong and supportive enough to carry a much bigger wrappee. Oscha wraps are available to buy from the Oscha Slings Website. I recommend following their Facebook Page for news of their upcoming releases, special offers and 'Secret Stash Friday'! If you like the sound of this stunning wrap, follow The Wrapping Years on Facebook for an exciting giveaway very soon!